Our extensive selection of designer fabric and trim offer endless possibilities. In addition to our in-stock fabric and trim we carry all the major lines including: Robert Allen, Beacon Hill, Brimar, Brunschwig & Fils, Carole, Cowton & Tout, Duralee, Fabricut, JF, Highland Court, Kravet, Lee Jofa, Michael's Textiles, Osborne & Little, Pindler & Pindler, Scalamandre, Schumacher. Sit down for a while and browse through our many sample books or choose a few to take home with you. Our diverse selection of colors and styles are updated seasonally, making us one the best fabric stores in Pittsburgh. For over 70 years, The Robert Allen Group has been the source for the world’s finest fabrics. Long recognized as the vanguard of innovation, the Company pioneered the broad distribution of fabric books. The renowned Robert Allen Color Library, with its exceptionally effective method of organization by color, was another industry first introduced by the company. Inspired by all things intriguing and relevant, whether art, history, nature or architecture, our designs are always fresh, original, stylish and inventive. Beacon Hill brings exclusive, finely crafted fabrics to the interior design community. Inspired internationally and designed for luxury, the offerings are truly one-of-a-kind. Beacon Hill has a tradition of using refined materials, an opulent color palette and sophisticated constructions to provide understated elegance for those seeking a gracious style of living. Over the past two years Beacon Hill has partnered with Christie’s auction house to create vignettes using objects from Christie’s interior auctions and Beacon Hill textiles. A family-owned company since 1986, Brimar is a reputable source for decorative trimmings, drapery hardware and textiles to the trade. A provider of exclusive inventive designs we aim to inspire the designer’s creativity to develop exquisite window treatments and embellish furniture, bedding, pillows, throws, table skirts and accessories suitable for residential or commercial use. Brimar offers the special details that lead to one-of-a-kind designs. An array of decorative fringe, gimp, boullion, tapes, cords, tassels and tiebacks in opulent colors and unique yet timeless styling allows designers to punctuate their signature style into traditional or transitional settings. Our fine fabrics include hand-printed silks, textured damasks, delicate sheers, woven cotton blends, 150,000 double-rub velvets and more. In 1941, Brunschwig & Fils founder Roger Brunschwig went off to war and his wife, Zelina, took over the family business. Mrs. B, as she was affectionately called, was a woman of great style, sophistication and inventiveness. Mrs. B is credited with developing the brand and aesthetic of Brunschwig & Fils as we know it today and for introducing scheming into its marketing efforts. Her motto "Good Design Is Forever" still holds true today. Mrs. B collected documentary textile designs found in American houses for years, and she was keen to make use of the great collection of European documentary patterns that her husband, Colonel Brunschwig, and his father, Achille, had collected and stored in France. It was arranged for these precious documents to be packed in map cases and sent to America for safekeeping during WW II. More than 10,000 documents are now preserved in the Brunschwig & Fils archive. The Brunschwig & Fils collection displays a constant recycling of past designs – updated and recolored when necessary – illustrating the company’s motto that good design really is forever. Carole Fabrics has been proudly serving the interior design community for more than fifty years. Carole takes pride in its reputation of exceptional quality, a constant awareness of fashion trends and our commitment to unsurpassed service. Augusta, Georgia is home for the Carole Fabrics national complex of their state of the art workroom, distribution centers and customer assistance facilities. These encompass more than 250,000 square feet. Whether you need the finest quality custom window treatments, or same day shipping for your cut yardage order, you can rely on Carole Fabrics. Cowtan & Tout is a unique offering of elegant, colorful and timeless designs. Its collections offer a wide range of decorative choices with an American point of view. Tradition is reinterpreted for a modern, classic interior. Cowtan & Tout offers an eclectic selection of prints, wovens, silks, sheers, leathers, trimmings, and wallpapers. Fabricut is one of the largest, most progressive distributors of decorative fabrics in the world; the brand designers depend on for everyday decorating. We are a quality driven company providing home furnishing fabrics and accessories of exceptional design and value to the interior design industry. Our devotion to supplying exquisite fabrics and trimmings is over 50 years strong and continues with a daily commitment to develop exclusive products for our customers. With an array of traditional, transitional and contemporary styles, patterns and palettes available, Fabricut is the designer’s preference for fabrics and trimmings. Our extensive line of in-stock fabrics, extraordinary customer service and a knowledgeable, worldwide sales force is unmatched. Fabricut's dedication to the customer is at the center of its business. Experience Fabricut and experience the unlimited possibilities of interior design. Highland Court's line of Luxury fabric is ever expanding with new collections, colors and concepts. This beautiful line features the finest silk and most intricate embroidery from around the globe. Damasks, silk embroideries and sheers for every idea and design. Joanne Fabrics Inc. is a family owned and operated company that commenced operations in September 1977...Headquartered in Toronto, Canada, Joanne sells to over 15,000 customers across North America, marketing our product under the name Joanne and J.F. Fabrics. Customers include retailers, designers, decorators, upholsterers, large department stores, hospitals, health care facilities, hotels, restaurants, furniture manufacturers, nautical and recreational vehicle manufacturers. Fabrics are selected and edited from major mills around the world. Considerable planning and resources go into the design of each of our sample programs. It is through this medium of sampling that Joanne gets its product into the marketplace. New product lines are introduced four times each year. Kravet Inc., established in 1918, is the industry leader in the to the trade home furnishings industry. This fourth generation family business distributes fabrics, furniture, wall coverings, trimmings, carpets and accessories. Kravet is an industry leader in to-the-trade fabric selection, offering the widest range of colors, patterns and textures for every design style. The Kravet Green collection is made 100% recycled polyester, which is a unique blends of post-industrial and post-consumer fibers woven and treated with no additional chemicals. During the finishing process, we use water-based products and environmentally approved dyes for a look that is eco-friendly without sacrificing style or quality. After years of enjoyable use, these fabrics are recyclable. Lee Jofa has been a leading source of fine fabrics for the discriminating interior designer for almost two centuries and has mastered the delicate harmony between the past, present and future. Osborne & Little is one of the worlds leading names in fabric and wallpaper design. Cherishing its reputation for innovation and quality, it has grown into one of the great British brands, globally renowned and respected. Started in the London of the Swinging Sixties by Peter Osborne and his brother-in-law Antony Little, its very first award-winning collection of exciting hand printed wallpaper broadened design horizons and brought instant success. For over four decades Osborne & Little's designs, across printed fabrics and weaves as well as wallpaper, have been at the heart of interior trends, from the paint effects of the 1980s to the holographic papers launched in 2010. Osborne & Little is, in addition, proud to be the distributor of two distinguished brands; the collections of internationally celebrated interior designer NINA CAMPBELL and of the elegant Parisian design studio, LORCA. Osborne & Little is as inspired and energetic today as ever, creating a constant stream of new collections that push forward boundaries and maintain a hard won reputation for excellence. Pindler & Pindler Inc. has spent over 60 years in business perfecting the art of fabric design and development. Our commitment to provide a unique and ever expanding product assortment to the professional interior designer remains unchanged. A destination since 1929 for connoisseurs of fine design and all things beautiful, Scalamandre’s beloved signature classics, as well as its fresh new collections, infuse style, elegance and vitality to the rooms of today and tomorrow. A standard bearer of imported and domestic fine textiles, Scalamandre continues its legacy of traditional, historic, classic and contemporary designs creating luxurious, high-end fabrics, wallcoverings, trims, furnishings and accessories. 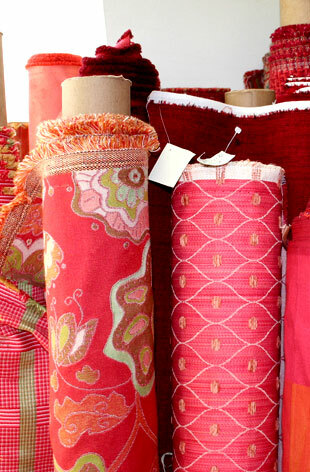 An extensive selection of exquisite fabrics enables a designer to create luxurious and comfortable spaces. Since 1889, Schumacher fabrics have brought luxury and elegance to homes and other interiors where only the finest quality will suffice. These collections feature numerous classic styles and designs, including fine silks, beautiful printed fabrics and European-influenced wovens, as well as an assortment of innovative modern designs.